Like “Castle,” “Absentia” concerns crime, though that’s where their similarities end. 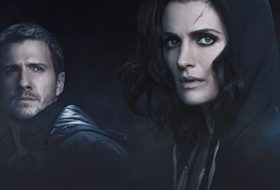 While “Castle” — in which Katic co-starred with Nathan Fillion — was a dramedy procedural, “Absentia” is a thriller. Katic plays FBI agent Emily Byrne, who reappears six years after she’s declared dead. To make matters worse, she has no memory of the missing time. Upon her return, she finds that her husband has remarried and she’s implicated in a new series of murders. After “Castle’s” eighth season, ABC announced that Katic would not be part of a potential ninth season with Fillion, reportedly due to “budgetary reasons.” It was an unpleasant surprise for Katic. But Katic says that filmmaking is also one of her longtime interests — another reason she was drawn to “Absentia.” “Regardless of any experiences in the past, for me it really is important to be engrossed in as much as the creative process as I possibly can,” she says. “I was surprised with how much the eight years I spent on ‘Castle’ actually serviced that. I ended up, in a way, having a free education on that show. One unexpected aspect of her “Absentia” role, however, is the fact that Emily is a mother. 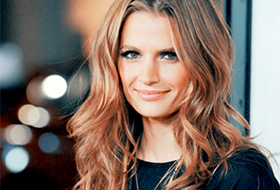 Although Katic had many offers after “Castle,” she had specific limits in mind. But when “Absentia” came to her attention, she perked up. Her main sources of inspiration to play Emily might be surprising: Cillian Murphy and Tom Hardy. “I love Cillian Murphy’s character in ‘Peaky Blinders’ and Tom Hardy’s in ‘Taboo’ — theses are characters that as audience members, we follow along with and root for,” she says. “But our own morality is tested throughout that journey, because these characters ride a thin line between morality and amorality. We met her as the fearless detective Kate Beckett in ‘Castle’ and, since Monday, as Emily Byrne, the protagonist of ‘Absentia’, a new AXN series in which she also serves as a producer. She does not abandon the characters of action, because now she gives life to an FBI agent that disappears trying to hunt a serial killer and is declared dead. The story begins when, after six years, she is found in captivity has no memory of what happened. Added to all this is the fact that her husband has remarried and now feels guilty for not having looked hard enough for her. All these are enough ingredients to get our attention and to ask some questions to Stana Katic. Your character is assumed dead and when she reappears, her husband has married another woman and her son doesn’t remember her. How would you deal with this situation in real life? Ha! No idea. Fortunately, my partner and I have to face much simpler decisions … like what we are going to eat for breakfast. Besides being an actor in this series, you are also a producer. Do you feel like directing in the future? Of course! I would love to direct a story that I was passionate about. In one of your most popular roles in the series ‘Castle’ you gave life to a detective. Now you get into the shoes of an FBI agent. What differences and similarities do these two characters have? ‘Absentia’ is a thriller. “Castle” was a police procedural that mixed romance, comedy and drama. Given your predilection for these types of roles, is being a police officer your missed profession? I deeply respect people who choose a profession of serving their communities and the entire planet; and although it’s fun to play action heroes, it has nothing to do with the amount of character, strength, and altruism that true heroes have. Would you like to play some historical character? Of course. Quick! Where’s my corset? How is it to give life to two women who work in a world dominated by men? Normal. It reflects our world today. Gender, race and religion barriers to job opportunities are becoming more and more archaic. That is, at least I hope so, we are moving towards a world that hires people by their skills and talent and not by the color of their skin or the bathroom they go to. On the red carpet, do you feel more comfortable with a romantic and feminine look or a more masculine style? I am at a disadvantage by answering this question because I grew up in a home where my father encouraged us to chat at dinners about math, science, history, politics, and topics like that. My father gave the same value to my opinion as to my brothers. So my perspective on career, styling and leisure is not so conditioned … I simply choose what is comfortable and inspires me in the moment. View the photos that accompanied the article in HQ at the link below! Another Castle shocker. ABC has canceled veteran crime drama procedural after eight seasons. The May 16 finale will now be a series finale. The cancelation comes after ABC sibling ABC Studios went through the trouble of maing new deals with star Nathan Fillion as well as co-stars Seamus Dever and Jon Huertas for Season 9. The show dropped a bombshell last month when co-lead Stana Katic was not asked to come back, along with fellow original cast member Tamala Jones. The move drew big backlash from fans. Still, signs had been pointing to a renewal, possibly for a shortened, 13-episode ninth season at a reduced license fee. There was a red flag last Friday when ABC did not make a pickup by the deadline it had to make a decision on the show. Castle already had a road map for Season 9, drawn by Alexi Hawley and Terence Paul Winter, who joined as showrunners at the beginning of Season 8 and were expected to come back for Season 9. Now, the show will remain about Castle and Beckett til the end, with no Castle 2.0 where Castle flies solo.